It looks unlikely that there was any 20th century mining in the areas other than West and Wood Mines. For more detail on the history, refer to the history pages elsewhere on this site. The table below both lists the mines and tries to allocate them to periods: blank spaces mean "probably not". It is highly probable that this table will change over time as new information is obtained so don't quote me! The names are largely modern names, an explanation of their origins, where known, can be found HERE. Opencast Canyon Probable: some stubs of passage are hand-picked Probably re-exploration Probable to extract malachite deposits. Beacon Lodge Trial Likely to be part of the extension of Engine Vein along the main fault to the west Possible as part of proving ore deposit. Straight Mine Could have been trials in this period ... ... or this period. Cross Mine Could have been trials in this period ... ... or this period. Brynlow Field Open Cast including Field Shaft Probable as it used the Hough level for ore withdrawal. Because of the number of sites and the fact that many of them are not readily accessible, only a brief description of each will be provided. There were several entrances but only one has been open in recent history. This leads into a low chamber used as a badger den at one time. Another lower passage connects through a small hole in the floor. There are signs that there are other passages and shafts in the area. One shaft was found in the last few years by the author Alan Garner. A low entrance on the Stormy Point Fault leads into a short passage connected to a shaft to surface followed by trials ending in dead-end passages. Two shafts connect the level to Twin Shafts. An opencast working on the Stormy Point Fault with two short levels and two shafts dropping into the further reaches of Reeking Mine. Another shaft on the Stormy Point Fault with some shallow workings and then an inclined shaft down to the level of Doc Mine but (currently) with no connection. There is a "rift" entrance where a small fault has been worked out and a shaft entrance, both of which lead into the chamber which is now partly filled with massive brick pillars. The chamber leads into a further chamber. The whole mine is very low and looks as if it was an extension of workings further down Stormy Point extracting copper from the join between a clay bed and sandstone. It seems likely that these working went underground at a level below the current chamber in Devil's Grave but the roof has progressively collapsed leaving the mine as it is now. Smaller Stormy Point mines There are a number of probable mine sites and short trials between Devil's Grave and Doc Mine. Outside Doc Mine, there are Bronze Age remains. Doc Mine itself is in two distinct parts with the upper cross-shaped section now the only section open. This goes down a sloping passage to a pair of crossed faults where copper was probably found. Just at the bottom of the entrance slope, there used to be a way into the lower mine which ran from outside the entrance of Pillar Mine right along the Stormy Point Fault. There is still a shaft entrance (sealed) into the lower section but the passage is now severely truncated since there was a collapse on an old shaft to surface. In the near surface sections, there are the remains of hand-picked passages in the roof. Beyond the collapse and now inaccessible, the mine extends right across Stormy Point in a trial passage until a large chamber is reached which has a passage at the top that might connect to Rock Shaft. The mine is now in a fenced enclosure. WARNING: there is water in the upper section of the mine and this could create a risk of drowning. Pillar Mine The large open entrance of Pillar Mine is well known as the main "cave" for visitors. Unfortunately, it has suffered over the years and the Pillar was demolished by vandals in the 1970s. Inside the large entrance, the passage quickly reduces in height, mainly because of silt that has washed in. The full height is not known but evidence suggests that the floor is raised some 2 metres under the main arch. The main passage leads to a round chamber with a second chamber up a little and to the left and a sloping passage down to the right which often contains water at the end. Because of the vandalism, the mine has been enclosed in an outer fence and also gated. Do not try to force the gate. WARNING: the mine has abused by many of its visitors and fires, burning candles, broken glass and worse were often found in the inner sections. Fires and candles will lead to bad air and glass etc can be physically dangerous. Unauthorised and ill-equipped visits should not be attempted. "Iron Gates" This is a small excavation near a footpath containing one chamber and a rock pillar. The Canyon The Canyon stretches from Square Shaft (see the Hough Level) in the north to Round Shaft in the south. It has some hand-picked sections as well as some parts blasted with gunpowder. There is water in the wider part and a small submerged passage which leads to Square Shaft and was the means for removal of ore in the late-19th century. Trials between the Canyon and Engine Vein There are a couple of workings in the wood between the Canyon and Engine Vein. One appears to be a small trial, a second is possibly a low level entrance to the Great Quarry and a third leads to a passage on a vein parallel to and north of Engine Vein. Beacon Lodge Trial A small passage leads in from the main track into the woods from Beacon Lodge. 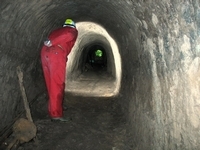 The passage heads towards a now-blocked shaft (used for many years as a rubbish dump by a former NT warden). The passage is very low so the path must have silted up by 1.5 to 2 metres over the years. Mines between Cobalt Mine and Finlow Hill The Cobalt Mine ends at the entrance to the current car park but we know of further passages and shafts between the car park and Finlow Wood. One passage was cut into by the Electricity Board many years ago. None of these features are accessible now. Finlow Hill Mine In Finlow Wood, there is a compact mine near the south boundary. The mine resembles the Cobalt Mine in many ways and we presume that it is the southernmost extent of the cobalt exploration of the early 19th century. There are several entrances and one has now been capped as a secure entrance for the DCC. Inside, the mine is on two parallel "veins" and at least two levels. Church Quarry Mine This tunnel at the back of Church Quarry, behind the Wizard, may not be a copper mine at all. It resembles the blasted passages in West, Wood and Engine Vein but it follows the join between a poor quality conglomerate and a good quality freestone. Until someone comes up with a better explanation, I believe that the tunnel was a trial planned to test the quality and extent of the building stone at a point in the quarry where removal of the overburden was probably becoming uneconomic. The tunnel is a straight passage with no branches. It was used at one time as a wood store by the part-time warden, John Evans, who had a hut in the quarry in the 1930s. Straight Mine This passage is about 100 metres long and is straight (!) apart from a short branch near the entrance and a short T-shaped passage at the end. The mine usually contains water in the middle section and bad air is sometimes released because of the decaying wood left in the water by ignorant visitors. Cross Mine Cross Mine has a straight and effectively level; passage in with a sloping cross-passage running down from right to left with water at the end of the left hand branch. At the end, there appears to be a blocked shaft. Lost Mine Lost Mine is secured with a lid at the entrance which is normally covered with turf to protect the site. The mine is straight and slopes down steadily to a blind end. There is an interesting ventilation arrangement at the entrance with a small bore hole to surface just after the main entrance. The mine appears to be late 19th century but its purpose is difficult to understand: it could not be used for drainage out of the mines because of the slope. Brynlow Field Open Cast including Field Shaft Within the Brynlow field, between Brynlow Dell and Windmill Wood, there is a large depression which was once an open cast copper mine. This has been partly filled and smoothed over. Around the perimeter of the area, we know of four definite routes for ore from the opencast to be loaded down into tubs on the Hough Level. One of the routes, Field Shaft, subsided in the 1970s and was dug open by the DCC. Two of the routes go into the Probationers' Series, part of Wood Mine. Scout Hole Scout Hole is a bit of an enigma. There are definitely two mines in the vicinity, an 18th century one covered over now and the 19th century gated passage. The larger gated passage leads down dip to brickwork which appears to have been associated with the 19th century ore treatment works. If there was no other evidence, one could believe that the tunnel was related solely to the works however in West Mine, there is a section of similar passage that runs along the north side of the Main Chamber and down the Canyon Passage. This passage runs beneath or links with at least five shafts to surface within the confines of West Mine. My hypothesis is that Scout Hole was the pilot tunnel for the whole West Mine complex, started on the edge of Windmill Wood with access to the then engine house and works. Later, when the section beyond the works had been rendered obsolete, Scout Hole was converted into a culvert and air supply to parts of the works. None of the mines described in this section are officially open to the public. Most of them are not leased by the DCC although we keep a check on safety of the mines for the National Trust. Any requests for access should therefore be made direct to the Cheshire Countryside Manager of the National Trust. We advise making requests in writing and giving adequate time for the National Trust to reply. If expecting a written reply, it is courteous to enclose a stamped addressed envelope. Go to the main photo gallery for more pictures of some of the other mines. Please note, some detail may not be shown at present for security and safety reasons.